Is there anything worse than securing the brand new mobile or electronic device of your dreams only to see it lying on the floor smashed, along with your dreams just days later? When you purchase insurance with your My Gadget Buddy discount code, an incident of this nature doesn’t need to be a full-on catastrophe. Whether your device is damaged, lost or simply stolen, My Gadget Buddy provides the coverage you need to safeguard the gadgets you love. My Gadget Buddy was founded in 2011 to provide insurance for the smartphones, tablets, laptops, cameras, game consoles and other must-have gadgets for your ever-more-mobile life. As a specialized insurance innovation of Rock Insurance Services Limited, My Gadget Buddy was launched on the 10th anniversary of the parent company as a demonstration of Rock’s commitment to innovations in insurance that meet the needs of the modern customer while still providing the same attention to customer service and high-quality coverage all Rock Insurance Services customers have come to know and love. All My Gadget Buddy policies are reviewed and overseen by the same Rock Insurance Services customer support agents who have worked to provide coverage for more than 1 million people to date. With a unique design allowing all My Gadget Buddy customers to choose the levels of coverage required for each individual device, My Gadget Buddy ensures that every customers is able to customize their coverage to reflect not only the value of the device but also the type and location of usage, guaranteeing a balance between value for money and the comfort that comes with being fully insured. With specialty coverage from My Gadget Buddy, your unique, useful and valuable devices are covered in the event of theft, loss, defect and accidental injury even when the original manufacturers can’t or won’t offer coverage. Don’t let another day go by without insuring the devices you know and love with My Gadget Buddy. Bring your My Gadget Buddy discount code online to the My Gadget Buddy online shop and click “Quote Me Now” to get started. 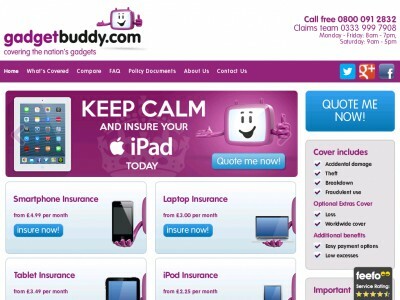 With your My Gadget Buddy discount code close at hand, enter the device you’re interested in insuring to see your quote. Double check to make sure you’ve chosen the right make and model, update the value of your coverage and choose to include coverage for accidental loss and overseas usage by checking the additional boxes or not, as you choose. Enter your personal details, your device details and your address before clicking “Continue” to finish up the online ordering process. Review your order and then accept the Terms and Conditions before moving on to make your payment and confirm your order, securing those My Gadget Buddy discount code savings. Begin by searching for the phone, tablet, laptop or gadget you’re hoping to insure. Review the selected model to make sure that it’s correct before choosing the value of your coverage; and, if you’re interested, selecting the boxes to secure coverage for accidental loss and coverage for overseas usage. Take a careful look over your order summary, and when you’re sure you’ve crafted the right coverage for you, you’re ready to redeem your My Gadget Buddy discount code. Add your name, address, and where requested the specifics of the device to be insured and then choose “Continue” to finish up with the online ordering process. Take a good hard look at the Terms and Conditions and then make your payment and confirm your order to save today with your My Gadget Buddy discount code. Send written notice to the administrator advising them of your decision to cancel your insurance within 30 days of your purchase. Make sure to include your insurance documents with your letter, and your coverage will be terminated as soon as My Gadget Buddy receives your documents. If you pay a monthly premium your first month of coverage will not be refunded; however, if you pay an annual premium you will receive a proportionate refund less an administration fee of 25% of the annual premium, with a minimum fee of £10. Don’t forget to check them often, as you can never be sure when a free My Gadget Buddy Discount code might be waiting for you! Buy now online at www.gadgetbuddy.com. You do not want to reckon with the theft, or untimely cracking of a new computer just to come face to face with the price of a replacement. So do the smart thing—gather up your My Gadget Buddy discount code, make your way to My Gadget Buddy and put that My Gadget Buddy discount code to work insuring your technical toys. Because with your My Gadget Buddy discount code you’ll save on the security you crave and when you’ve secured insurance with your My Gadget Buddy discount code you’ll never have to hear me say I told you so.